Raise or Fold: A Year of Risky Business: No pressure, right? Well Poker Grump brought me to your site so lets see what happens. The excerpts he provided were entertaining and mirrored some of my thoughts at times. Plus you are also from DC so I'll understand some of the DC references or even AC references. Good luck in Vegas, Sis. Give me the requisite jingle. To all of you who may have arrived here expecting gems of wisdom and fountains of wit, my humble apologies. Not reason to apologize. I arrived here from Grump's journal expecting a well-written, thoughful blog. Which is exactly what I found. Well, I read all of your archives in three days. Does that work? Good luck in Vegas! I'm rather interested in your posts because I live in your area and I know jack crap about the local scene. Of course, the main reason that I don't play poker much is my kids. But, I might be able to get a night free here or there if there's a seat available somewhere. Pokerwolf. Where do you live? I'm in northern VA in Alexandria. I know of some games on occasion. Of course Cardgrrl probably knows of better games being a pro and all. May I suggest that any discussion of games and locations take place direclly between the interested parties? I'm delighted to know of players in my area, but for a number of practical reasons (see recent newspapers, for example), I'd prefer not to have my blog be the conduit for game information. 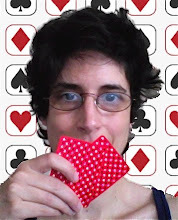 ouch, not so friendly cardgrrl has shown her teeth. @Anonymous: I don't know why a politely worded request would strike you as unfriendly. My motivation was in no way hostile. only wish I had free time to make Cardgrrl the movie... but, as always, hope you're well, and good wishes from this quarter, for whatever love you find on the morrow.